It’s been a dismal few decades for our troubled ozone layer, but it’s finally on the road to recovery, according to a comprehensive new assessment released on Wednesday. What’s more, it’s thanks to a laudable global effort to phase out the use of ozone-depleting substances, showing us what political determination can achieve. Almost 300 scientists from 36 countries contributed to the detailed report, which was published by the United Nations Environment Programme (UNEP) and the World Meteorological Organization (WMO). The ozone layer is a protective blanket of gas that shields us from harmful UV radiation emitted by the Sun. It started to decline during the 1980s and in 1985 scientists spotted a seasonal hole over Antarctica, prompting governments to start taking action to prevent further decline. It’s known that gases such as CFCs (chlorofluorocarbons) and halons—which were commonly used in products such as refrigerators and aerosols—can accelerate the depletion of ozone in the Earth’s stratosphere, so scientists and politicians across the globe put their heads together in a bid to reduce their use. In 1987, almost 200 countries signed the Montreal Protocol which was designed to phase out the use of ozone-depleting substances. The ozone layer continued to decline throughout the early 1990s but has remained relatively unchanged since 2000. Now, thanks to the significant decrease in the atmospheric abundance of ozone-depleting gases, it is finally starting to show signs of future recovery. Without the Montreal Protocol, it is estimated that atmospheric levels of these gases could have increased tenfold by 2050. Furthermore, according to the UNEP, the protocol will have prevented some two million cases of skin cancer annually by 2030, alongside protecting wildlife and agriculture. 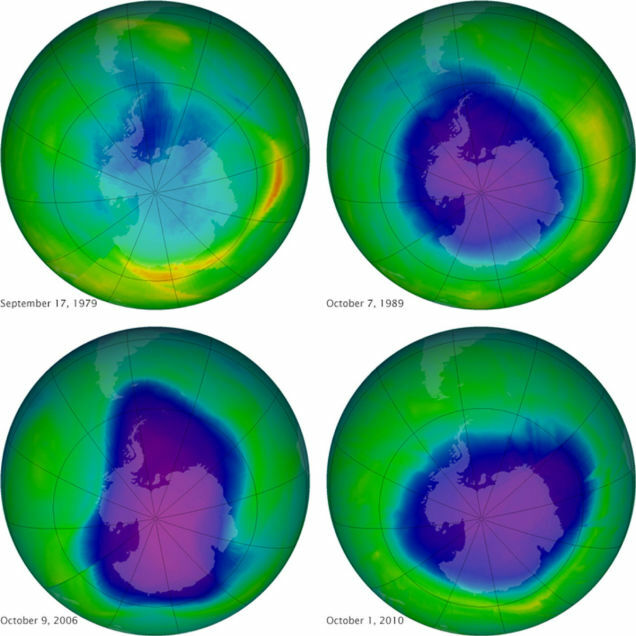 If signatories continue to fully comply with the Montreal Protocol, it is anticipated that the ozone layer above the mid-latitudes and Arctic will recover to 1980 levels before 2050. The seasonal hole above the Antarctic will take significantly longer to heal, however, since ozone-depleting substances can linger for many years in the atmosphere. Since many ozone-depleting chemicals are also potent greenhouse gases, the protocol has also had the added bonus of benefiting climate through significantly reducing these emissions. However, the substances used to replace them (hydrofluorocarbons) are also greenhouses gases and their emissions are steadily growing. If this doesn’t change, they are anticipated to contribute significantly to global warming in the future. Scientists will present their findings in November at the annual meeting of the Parties to the Montreal Protocol in Paris. The full report will be published next year.